1. In support of our children’s children, we recognise that this generation has the responsibility to repair the damage caused by the human induced aspects of global warming. 2. The simplest, quickest and most cost-effective way to address global warming is to encourage every human being in the world to source separate the organic fraction from their discard streams, so that it can be composted and returned to agriculture. In this way the carbon can be captured in the soils of the earth. 3. We call upon all governments to pledge their support for making every city and every region of the world as independently sustainable as possible. 4. We further resolve that we encourage all citizens and grass roots organisations across the world to heed this message and do everything they can to persuade their local, state and national governments to take this critical step of composting the organics in the discard stream. 5. In short, to save our species we need to save our soil – soil is the solution. 1) Global Climate Change. By sequestering carbon in the soil, it reduces the global warming which would be otherwise caused by the carbon dioxide, released rapidly when this material is burned, or the methane that is more slowly released in landfills. Also, in as much as the addition of compost to soil, reduces the need for topsoil, derived from other sources like peat, and from energy intensive synthetic fertilizers, it further reduces global warming impacts. 2) Soil enrichment. It goes without saying that composting on a massive scale will replenish the depleted soils of vital minerals and other nutrients and therefore is of critical importance not only to agriculture but also to human health. 3) Unemployment. Once the organic fraction is removed from domestic waste the remaining material is far easier to store, handle and mine for its reusable objects and recyclable fraction. Once cities have removed organics from their discard stream it is a relatively easy task to use large warehouse type facilities to recover glass, metals, plastics, wood, ceramics etc and create both large and small businesses and a large number of jobs in the process. In Brescia, Italy the city leaders spent over 300 million Euros to build a giant incinerator that only produced 80 full-time jobs. 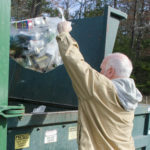 In Nova Scotia (a province of Canada) spent far less money on a curbside collection program for compostables and recyclables, and created 1000 jobs collecting and handling the discarded materials and another 2000 jobs in the industries using those secondary materials for re-manufacture. 4) Energy conservation. By expediting the recovery of more objects and materials for reuse and recycling, far more energy can be conserved (the embedded energy) when these materials and objects go back into commerce. Recycling reduces the energy involved in extraction and shipping primary materials around the globe; reuse of objects reduces both extraction impacts and manufacturing impacts. ICF, a Canadian consulting company, indicates that about 10 times more energy is saved recycling plastics than obtained by burning them to produce electricity and for one particular plastic, PET, 26 times more energy is saved. Overall Jeffrey Morris indicates that 4 times more energy is saved by recycling the total domestic waste stream than obtained by burning it to produce electricity. Relating back to issue 1, overall, a report from Europe indicates that a combination of recycling and composting reduces the emissions of global warming gases as much as 46 times more than incineration producing electricity (AEA, 2001). People need good food, clean air, clean water, clean air and strong communities. Zero Waste offers all of these, but will the world heed this message in time?